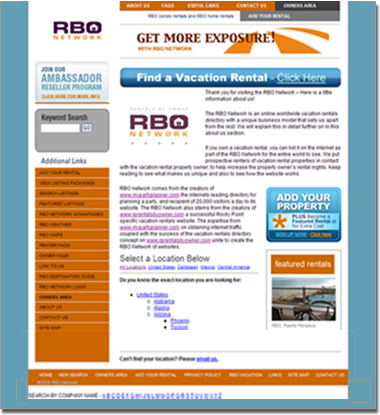 RBO Network is a unique new concept for vacation rental marketing. The RBO Network currently consists of 184 micro sites. Each of these micro sites is geared to service a unique destination. Lurus's goal was to create an administrative back end which would allow RBO Network administrators to control all 184 web sites from one location. In addition, Lurus created an email marketing campaign which has successfully allowed RBO Network to begin attracting new customers. Lurus also built a system which allows property owners to log into their own private area and edit their listings. This takes away from the workload for RBO Network staff. Owners are now able to upload pictures, edit content, block out dates, and perform many other functions.